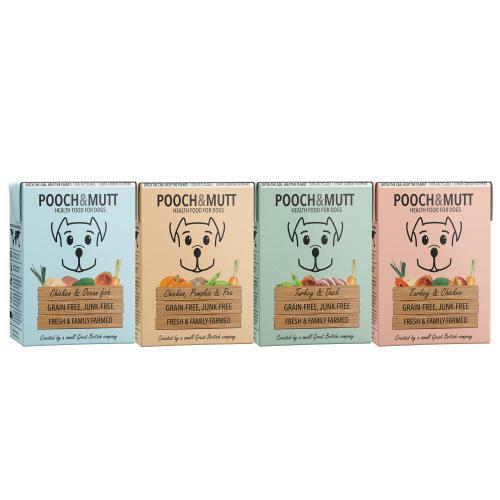 Pooch & Mutt Multipack Adult Wet Dog Food is the ethical (not to mention healthy and delicious!) choice your pooch will appreciate. The cartons have 80% lower global warming potential than a can, are 100% recyclable, easy to recycle and made from renewable resources. Free from artificial colours, flavours and preservatives, Pooch & Mutt Wet Food is rich in nutrients. Made with fresh, locally sourced ingredients the food is grain, cereal and gluten free - great for dogs with sensitive digestion. Suitable for dogs from 8 weeks and all breeds. Ingredients/composition: fresh chicken (32%), fresh tuna (20%), fresh salmon (4%), fresh carrots (4%), dried vegetables (carrot, broccoli, leek, potato) (1%), seaweed extract, yucca extract, fructooligosaccharide prebiotics (0.5 g/kg). Nutritional additives: vitamins: vitamin a: 2500 mg/kg; vitamin d3: 200 iu/kg; vitamin e: 30 mg/kg. trace elements: potassium iodide 0.8 mg/kg, cupric sulphate pentahydrate 20 mg/kg, zinc sulphate monohydrate 139 mg/kg, ferrous carbonate 33 mg/kg. Analytical constituents: crude protein 11%, crude fat 4%, crude fibre 0.2%, inorganic matter 2.5%, moisture 80%. Ingredients/composition: fresh chicken (60%), pumpkin (5%), green peas (1%), carrots (1%), seaweed extract, yucca extract, fructooligosaccharide prebiotics (0.5g/kg). Analytical constituents: crude protein 11%, crude fat 5.5%, crude fibre 0.2%, inorganic matter 4%, moisture 79%. Ingredients/composition: fresh turkey (26%), fresh chicken (21%), potato, carrot (1%), salmon oil, dried vegetables (carrot, broccoli, leek, potato) (1%), dried blueberries (0.25%), dried apple (0.25%), dried papaya (0.25%), seaweed extract, yucca extract, fructooligosaccharide prebiotics (0.5 g/kg). Nutritional additives: vitamins: vitamin a: 2500 mg/kg; vitamin d3: 200 iu/kg; vitamin e: 30 mg/kg. trace elements: potassium iodide 0.8 mg/kg, cupric sulphate pentahydrate 20 mg/kg, zinc sulphate monohydrate 139 mg/kg, ferrous carbonate 33 mg/kg. analytical constituents: crude protein 8%, crude fat 7%, crude fibre 0.5%, inorganic matter 2.5%, moisture 78%. Ingredients/composition: fresh turkey (45%), fresh duck (20%), green peas (3%), carrots (1%), seaweed extract, yucca extract, fructooligosaccharide prebiotics (0.5g/kg).Nutritional additives: vitamins: vitamin a: 2500 mg/kg; vitamin d3: 200 iu/kg; vitamin e: 30 mg/kg. trace elements: potassium iodide 0.8 mg/kg, cupric sulphate pentahydrate 20 mg/kg, zinc sulphate monohydrate 139 mg/kg, ferrous carbonate 33 mg/kg. Analytical constituents: crude protein 10.25%, crude fat 10%, crude fibre 0.2%, inorganic matter 4%, moisture 69%.